Anyone know motors? My Makita sharpener has a custom 560rpm 1.1 amp motor, which usually has plenty of torque, but suddenly the speed and torque dropped to the point where it can't do the job anymore, and the motor housing gets very hot. 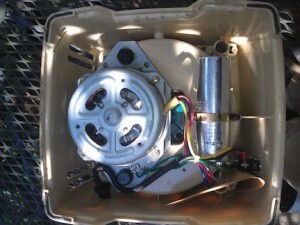 Pic attached of the insides. I'd like to fix it if possible, but replacement motors aren't available, assuming it's not that great honking capacitor, which is available, but I don't know where to even start troubleshooting. I suppose I could buy a replacement unit, I've had this one since 1998, and it's seen many hours of use, but I'd like to avoid the expense if possible. Any advice before I blow the tool budget again? I don't have any advice, but madbodger probably does. Sounds like a dirty commutator or worn brush. Should be fixable. I don't see a brush port, though some disassembly may be required. What would I look for for a dirty commutator? i just fixed my electric leaf blower, the brushes got stuck in their channels, wore, and the spring was not strong enough, jiggle jiggle wiggle wiggle... works! And madbodger confirms that the motor is dead. Since the motor isn't available as a replacement part, new sharpener ordered. I may try removing the motor, adding an external motor, and using a vbelt and pulleys to get this one running so I can have two grinders set up at a time, but that can wait.